SarahViz.com: Come Out, Come Out, Wherever You Are! To be sung to Rhianna's "Only Girl (in the World)"
on this Delurking Day in the blogosphere? and make me feel not-so-lame. I'm here. Not really delurking because you already know I'm reading. Right? I read every time you feed my reader! You're on my blogroll and I read you. Of course I read you, my fabulous friend! Oh hi, I read but don't really comment! :) I wish it were easier to comment on blogs read through a reader...(am I the only one who understands what I'm trying to say here?) Keep doing what you're doing and I'll keep reading! Love your blog!!! 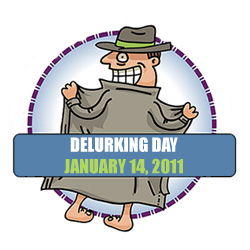 Happy de-lurker day! Great...now that song is stuck in my head! I don't know if I lurk here or not! I seriously can't remember! I have issues...have a great weekend! I'm TOTALLY lurking. :) Well, I guess not any more, technically, since I'm commenting. Anyway - I like your lyrics better than Rihanna's! LOVE. YOUR. BLOG. I check it every night. As a mom of 3 boys ages 7, 5 and 8 months I can relate to so much of what you write but I rarely comment. I guess as a reader (and someone who doesn't have a blog) I never realized the importance of comments from your end... always thought they were more of a nuisance to you. Will try to be better about that! Keep making me laugh out loud! I'm not so much a lurker as a slacking commenter. And my middle name is Awesome. I'm a day late but I'm here. I rarely leave comments but I read all the time! My middle name? Ack. Really? I really REALLY have to do that? I was named after my Aunt and I always hated that name. I loved Aunt Jean, don't get me wrong. But I wanted to be Katherine Maria or Katherine Rainbows and Unicorns... not Katherine JEAN. Maybe because when mom was mad at me it was always, "Katherine JEAN!" LOL! Thank You so much for making me feel not alone in this crazy part of mommyhood.